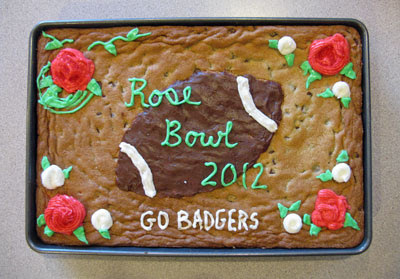 Brimful Curiosities: Rose Bowl Cookie Cake - Go Badgers! Afternote: Ahh, if only they would have won! Even if the Badgers didn't have a sweet victory, at least we had a sweet treat! I have never made a cookie cake, but that looks great! Looks pretty, and delicious! Without the frosting, once cut, they are cookie bars. A friend of mine went to the game and said that even though the Badgers lost the Badger fans still enjoyed themselves.